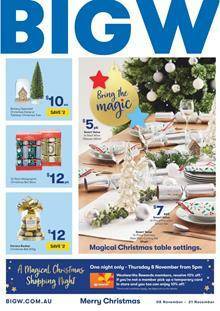 Ferrero Rocher, Smart Value Christmas table accessories are appealing products at first sight from the new Big W Catalogue Christmas sale. The preview contains Christmas trees and new special prices. The difference of this one from the previous Christmas catalogues is a weekend sale. It's, in fact, different by many more aspects. Jamie Oliver kitchenware costs half this week. Jamie Oliver oven glove, Bruschetta, tea towels, and more. Half-price deals on Tontine Good Night quilt QB, soft + snuggly microfibre cover are among the deals of Weekend Sale. This weekend sale will be valid on 10-11 November. Products from very different categories can come across with your sight. Dyson V6 Animal origin handstick is a simple device that will help you with cleaning even the toughest corners of your home. It will cost $349. Half-price deals on Tefal frypans. Pay only $74.50 for the product on pg 6. 6-pack premium Christmas bon bons $12 pk. Upgrade your makeup inventory with the cosmetic products on pg 10. Half-price deal on Revlon, Maybelline, lipsticks, mascara, and more are featured on pg 10. Toys such as Hot Wheels, Disney Frozen, Loaded Lemons, Justice League, Amazing Bubbles, Trillion Bubbles are also half-price deals. There are also sports and swimwear apparels in the weekend sale deals of Big W. Check out pg 12 for these products.